Today I have this card that I made using our Oh Happy Day stamp set. 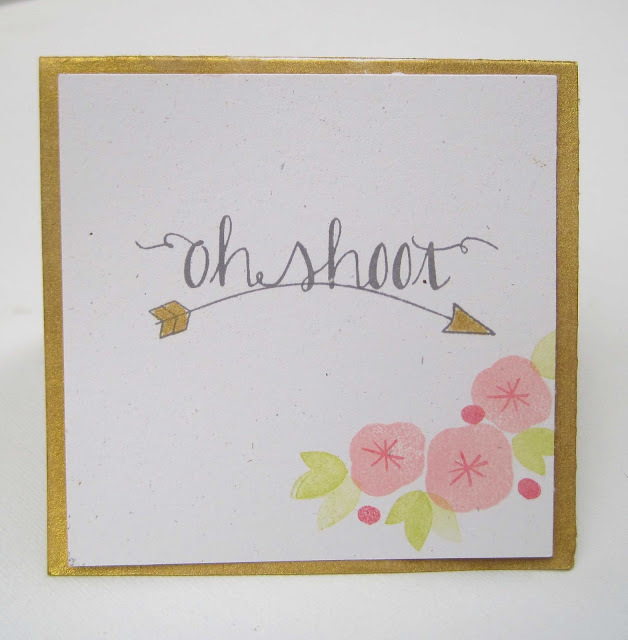 I just love the Oh Shoot sentiment that is in this set. 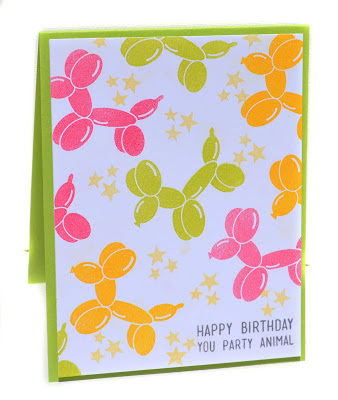 I swiped the base of the card with Delicata Gold Ink and colored the arrow image with it as well. It is so pretty in person. 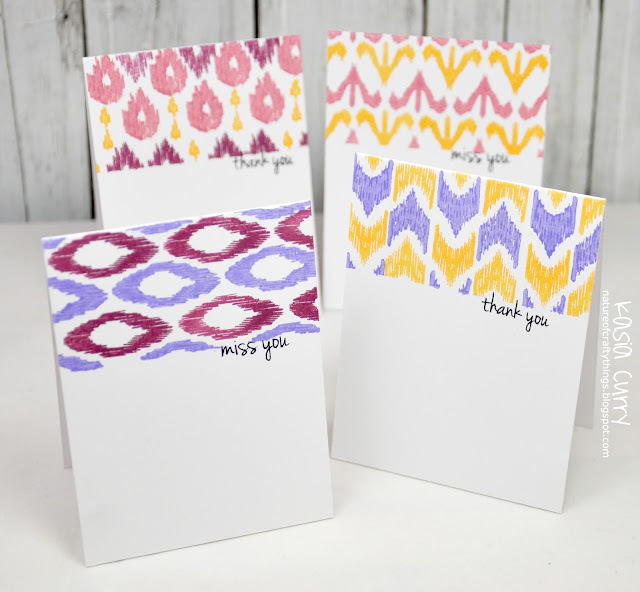 Today we have Kasia with this cute set of mini note cards using images from our Ikat Additions stamp set and sentiments from Roll With It. I love all of the patterns that she was able to create. So fun and modern!! 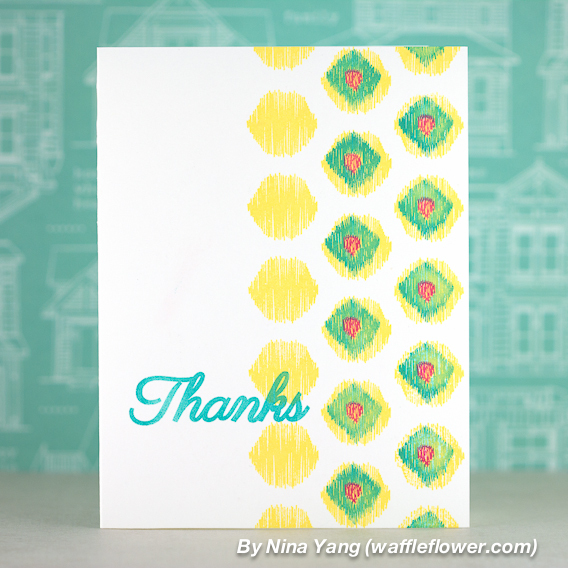 Today we have Nina Yang with this fabulously pink card using our Modern Leaves clear stamp set & dies. I love way she stamped the solid small leaf image inside the larger leaf/petal image to create this pretty and layered look. Hello everyone! 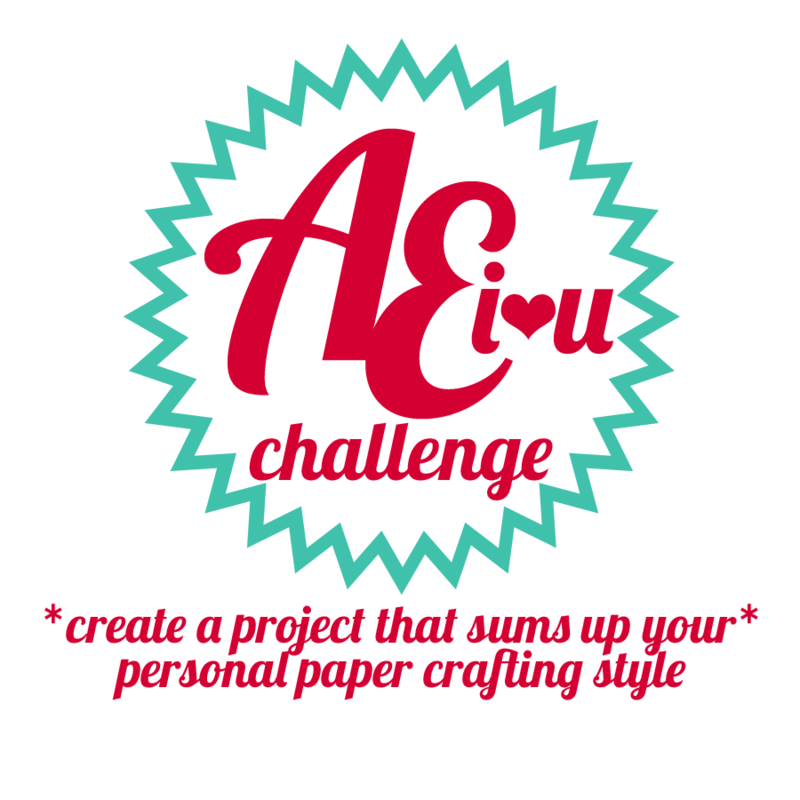 Just a friendly reminder that there is a little over one week left to enter our July AEI♥U Challenge! This isn't just any challenge. The winner will be our guest designer for September. How great is that? 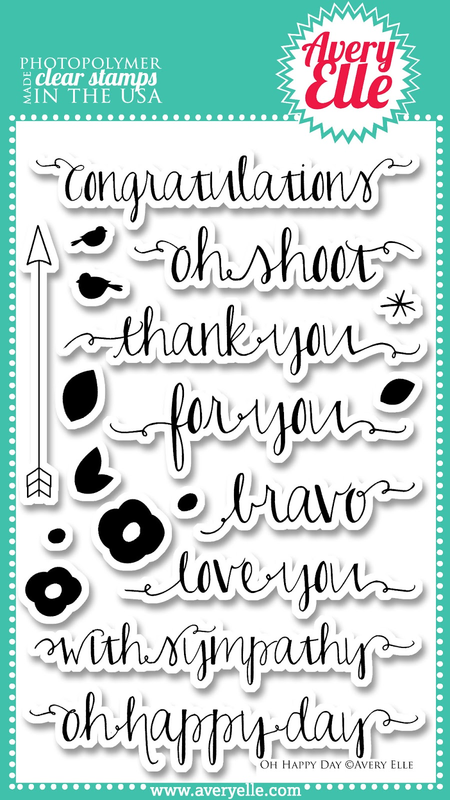 The winner will receive two stamp sets, will be required to make at least two projects per stamp set, will receive a special guest designer badge for their blog (if they have one), and will be featured throughout the month of September on the Avery Elle blog. 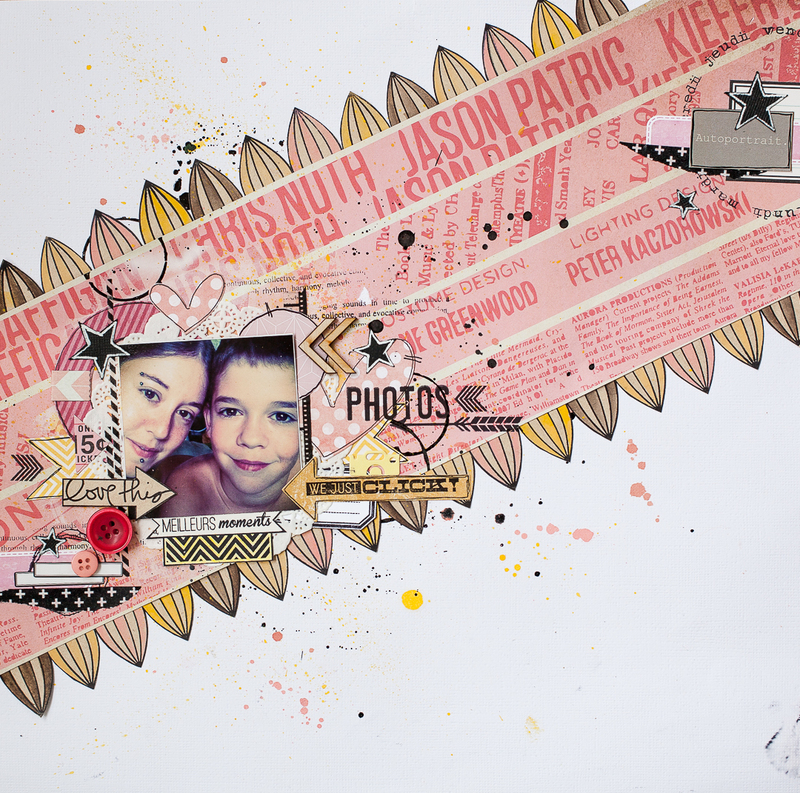 Maska created this layout using our Modern Leaves stamp set and coordinating dies. The border she created is just amazing. I love the detail! 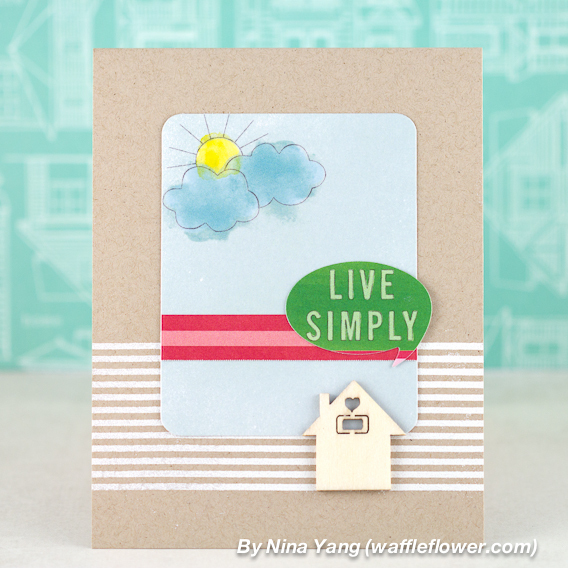 Miriam created these amazing projects using our Simply Tags: Everyday stamp set. I love this card and all of the shaker tags. They are too cute! We are so lucky to have Miriam as our guest designer this month. Donna created this sweet card using our Oh Happy Day and Framed Fonts stamp sets. I love that she took a few small stamps to create such a fun background. So cute! Hello everyone! I am so excited because our July AEI♥U Challenge is starting today!!! This isn't just any challenge. The winner will be our guest designer for September. How great is that? THE DEADLINE TO ENTER IS SUNDAY, AUGUST 4th. THE WINNER WILL BE ANNOUNCED ON MONDAY, AUGUST 5th. Today we have Maska with this lovely layout using our Oh Yeah stamp set and coordinating dies. I love the modern nautical feel that she created. As usual the combination of patterns and textures is spot on! 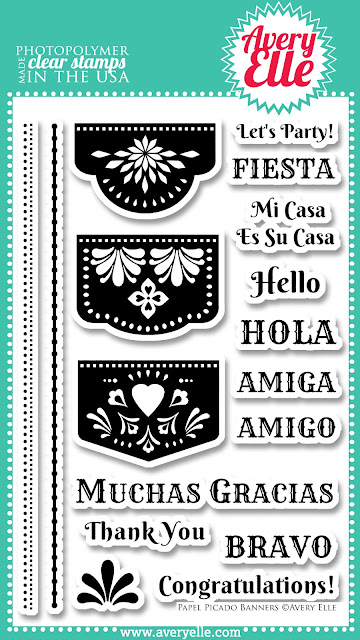 Miriam created this layout using our Papel Picado Banners stamp set. I love how she stamped the images in pastel colors to make it perfect for these sweet springtime pages. Beautiful! 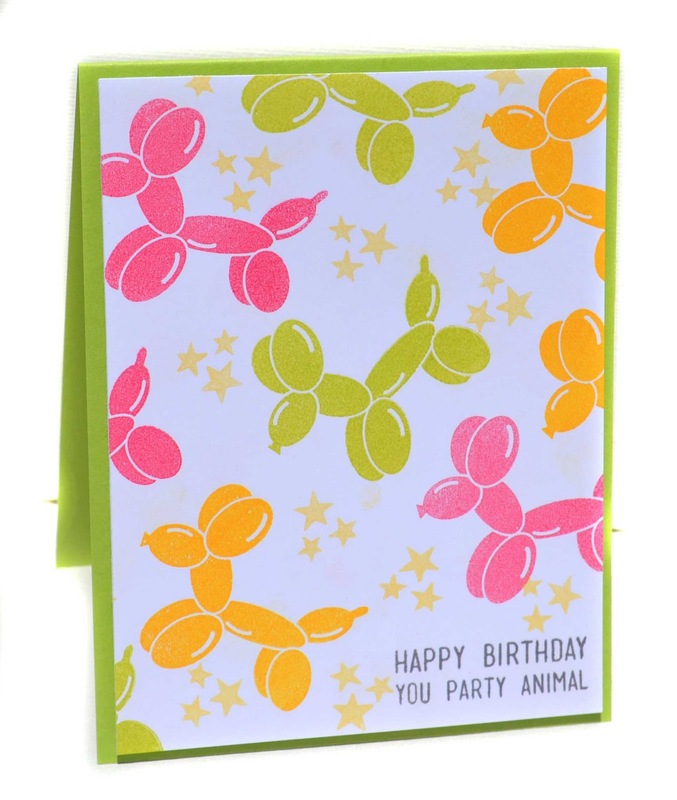 Today we have Chunyuan with this fun Party Animal card. I love how she stamped the images repeatedly in different colors and offset the front panel. 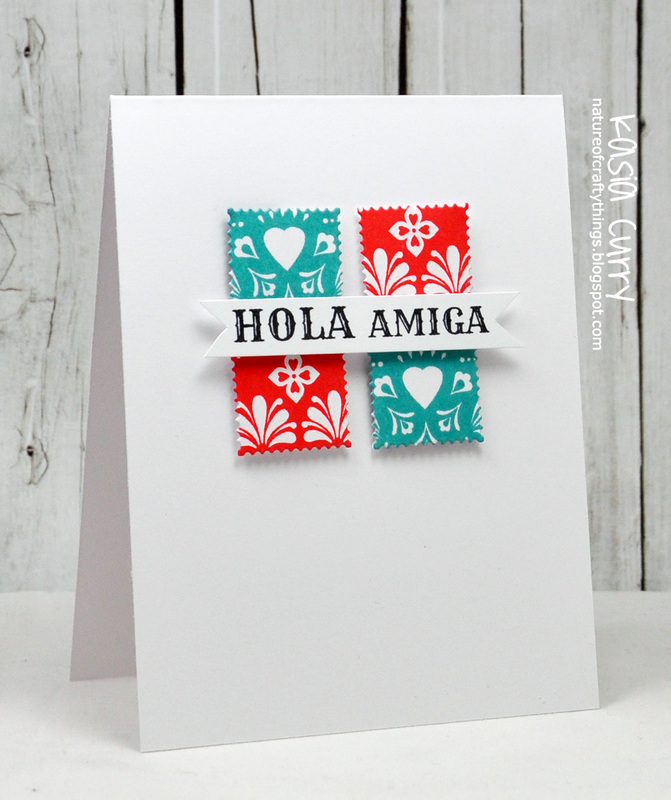 Kasia created this card using our Papel Picado Banners stamp set. Her idea to cut down the banner images into small squares is brilliant. I adore the look - clean, graphic and bold. 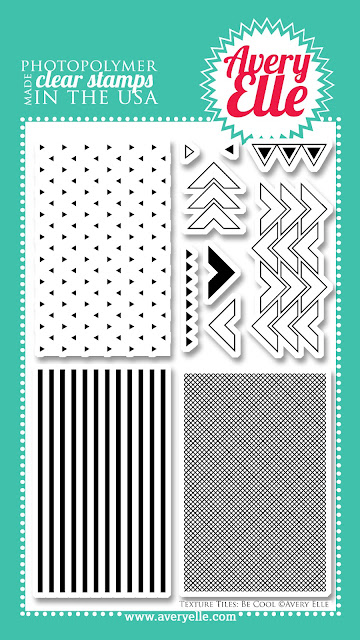 Today we have Donna with these fun and graphic tags. 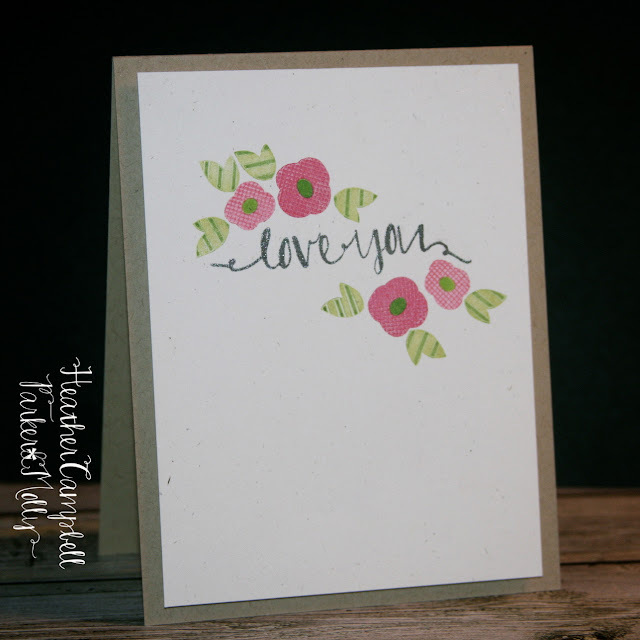 She stamped the stripes from our Texture Tiles: Be Cool stamp set onto the tag base and embellished them with our Petals and Stems stamps and dies. I love the way she tied the whole look together by using black and white twine. 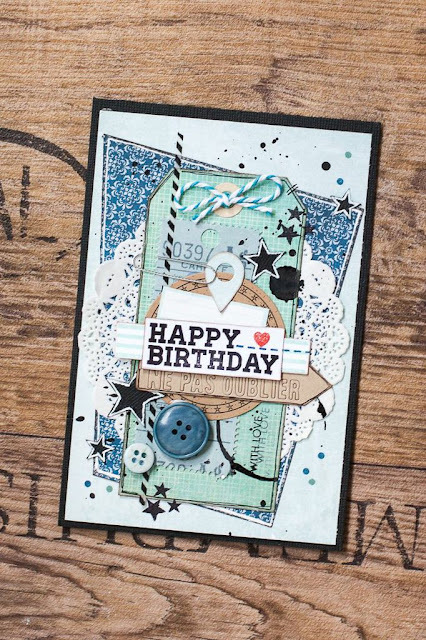 Nina created this card using our Oh Yeah dies and Texture Tiles: Be Cool. I love how she made the largest speech bubble look like a rounded rectangle mat on this card. What a great way to stretch these dies. Today we have JJ with this fun card using our Celebrate and Party Animal balloon stamp sets. 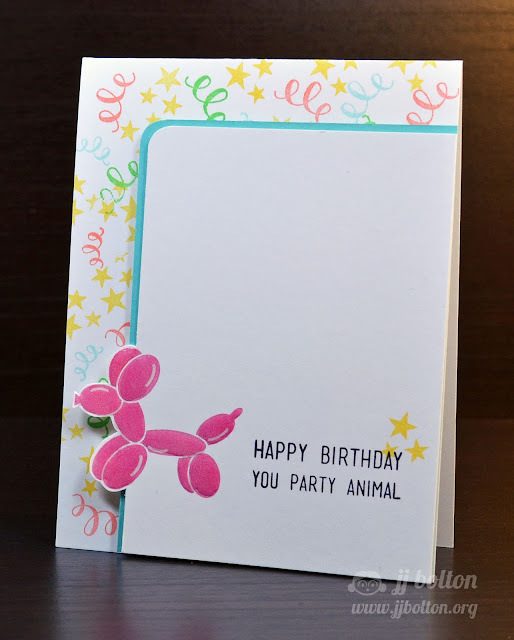 I love her stamped background and how the balloon is coming out of the page. Heather created this card using Oh Happy Day and Texture Tiles: Be Cool. One of the great things about Texture Tiles is the many uses that it has. 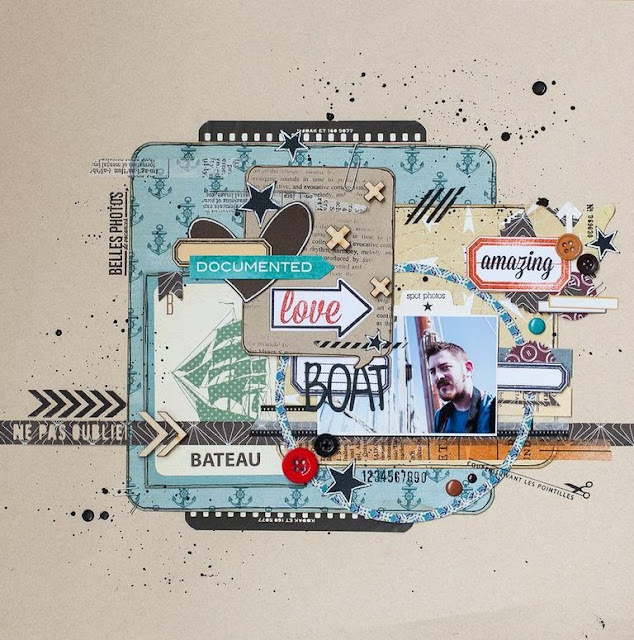 You can use the images alone or use them to created additional depth and texture for stamps you already own. This is exactly what Heather has done here by "kissing" or stamping the patterns onto inked up solid stamp images. I love sets that are so versatile. Be sure to check out Heather's blog for more details! Today we have Kasia with this pretty sympathy card using flowers and a sentiment from our Oh Happy Day stamp set. 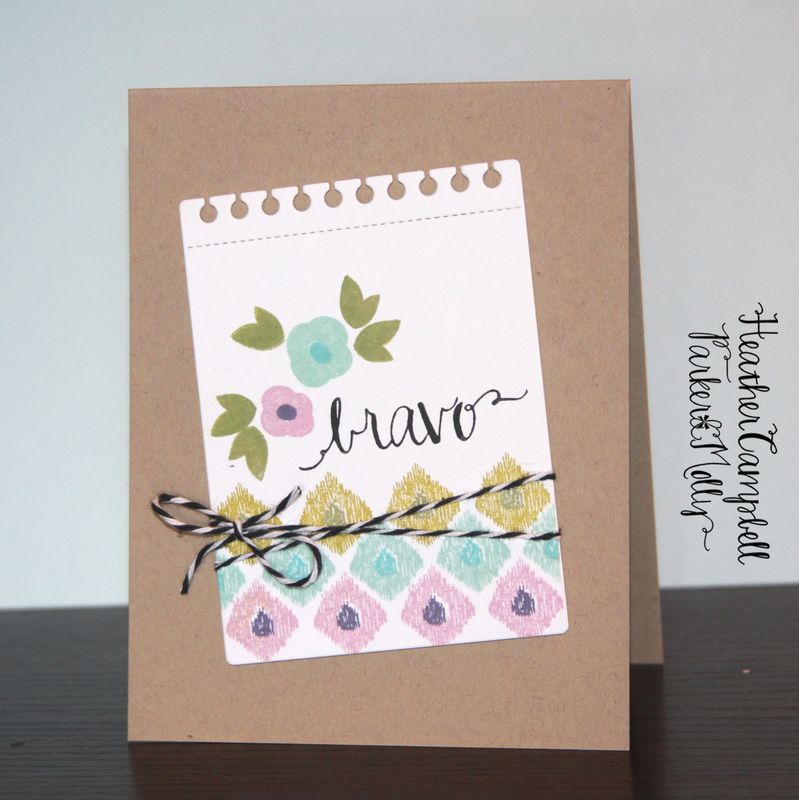 I love how she stamped the background stripes from our Knotty stamp set at an angle. 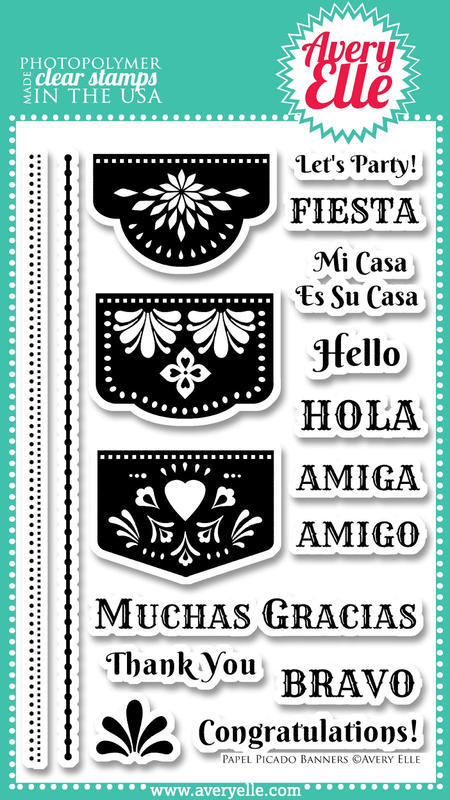 Chunyuan created this festive card using our Papel Picado Banners stamp set. She created this single layer card with a bit of masking and I think it is so fun! I love the Mi Casa Es Su Casa sentiment. Hello! I hope everyone had a wonderful weekend. Thank you so much for all of your kind words last week. It really made our day reading all of your sweet notes. 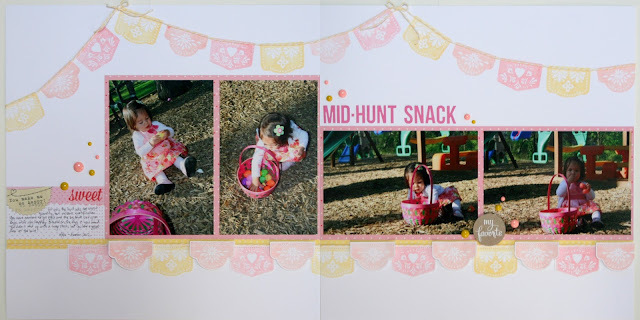 We have a winner today and two more projects using products from our latest release. Woot! Woot! 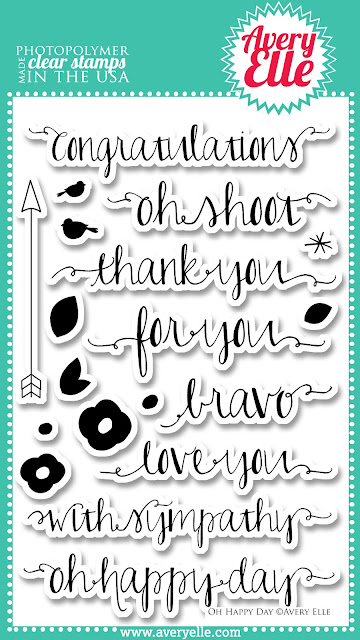 Our July Inspiration Blog Hop winner is Happy Dance / Bev for her comment on JJ Bolton's blog post. 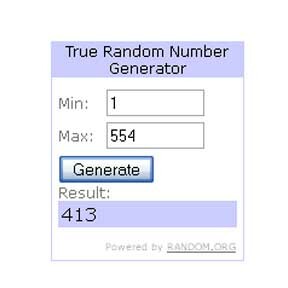 Congratulations, you are the winner of a $25 gift certificate to our store. 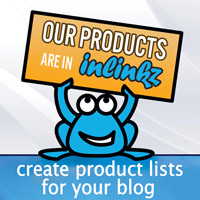 Please contact us at customerservice@averyelle.com so that we can get your prize to you. Let's get to the cute project that Donna has for us today. She created this pretty card using our Modern Leaves stamp set. I love how she paired up a small and medium sized leaf here. Be sure to check out Donna's blog today because I hear that she is giving away one of these sets. How fun is that? Nina created this modern card using our Ikat and Ikat Additions stamp sets together. Love the fun color combination and pattern that she created here. Hello everyone! 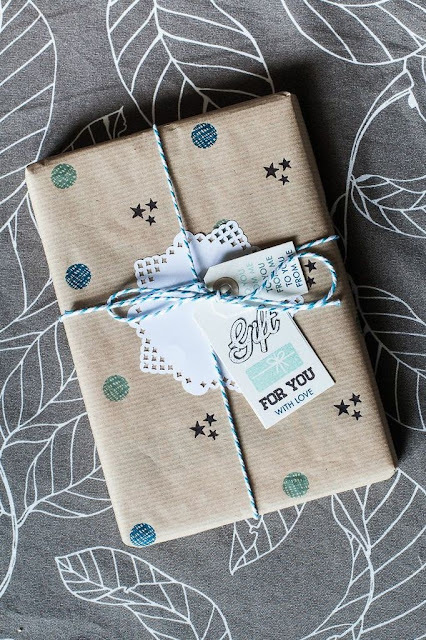 Welcome to our July Inspiration Blog Hop. 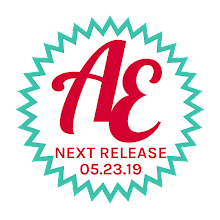 During this hop we will be highlighting four sets from our latest release that we didn't feature during our last Hop. We are also having a fun giveaway so be sure to go the end of this post for all of the details. All products are currently available for purchase in our store or at one of our retailers. 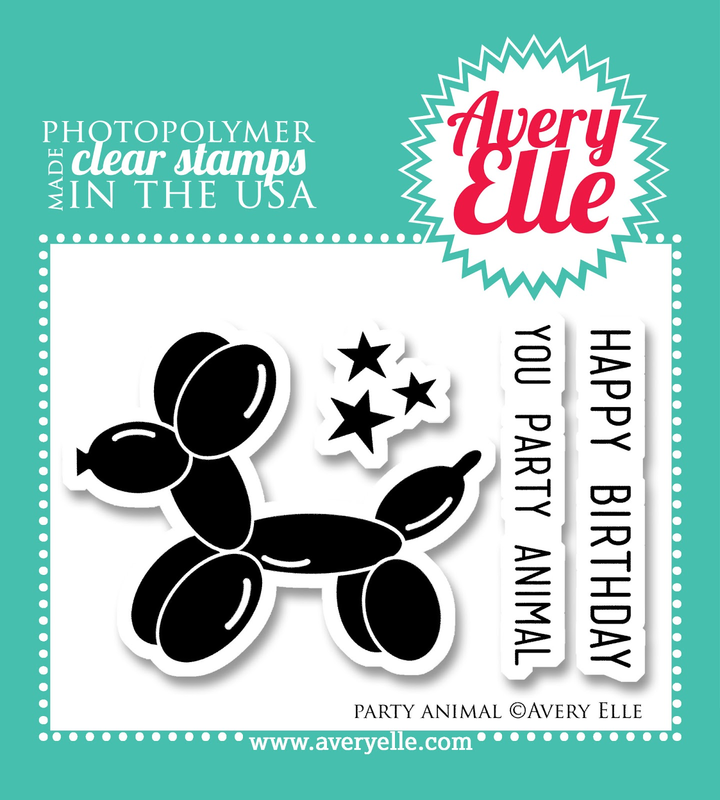 I created this fun card using our Party Animal balloon stamp set. I just love this little guy. Be sure to stop by Chunyuan's blog next. Have fun! 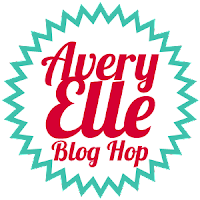 To celebrate our July Inspiration Blog Hop, Avery Elle is giving away a $25 Gift Certificate to one random winner. To enter to win just comment on this post. There is no purchase necessary and you must be 18 years of age or older to enter. This giveaway is void where prohibited. You can also do options 2, 3, 4, 5 or all 6 of the following to increase your chances of winning. You have until midnight Sunday, July 7th to enter. 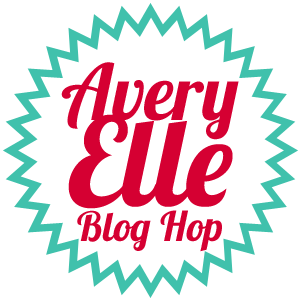 The winner will be announced on the Avery Elle Blog on Monday, July 8th . All products are now available for purchase in the Avery Elle store.